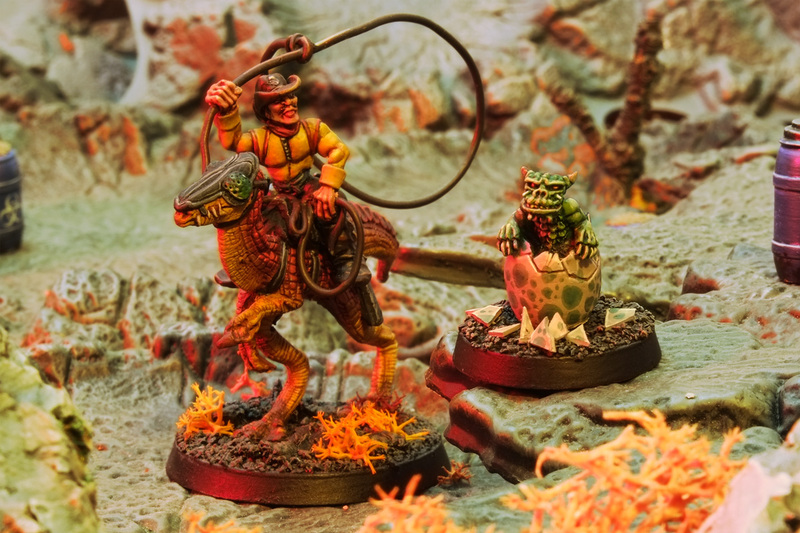 At BOYL (Bring out Your Lead) it's become a community tradition to create one-off figures to celebrate the three-day extravaganza of Oldhammery painting and gaming. Here are three from 2017 painted up just in time to pick up 2018's without any leadguilt. I really like event-exclusive miniatures as they're tethered to a set of memories of friends, games, meals out, heavy drinking, stupid decisions and hangovers. Lemme explain why these three minis came to be. Olivia was the 2017 event's commemorative figure, sculpted by John Pickford. 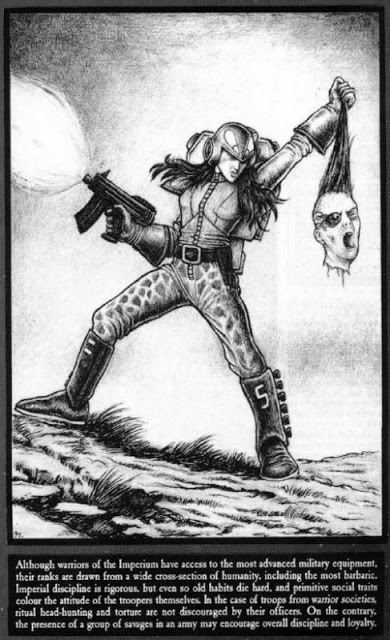 She's a 28mm metal incarnation of the classic 1987 Rogue Trader illustration by Martin McKenna. 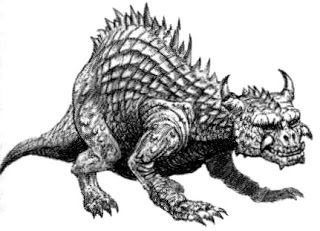 Grox are the cattle of 41st Millennium. 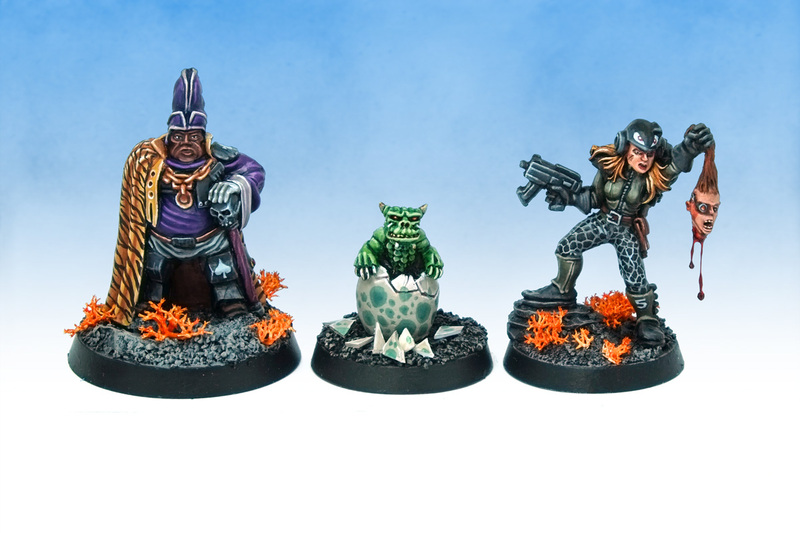 They appeared as an illustration in the 1987 Rogue Trader rulebook, though they've never had a miniature incarnation. 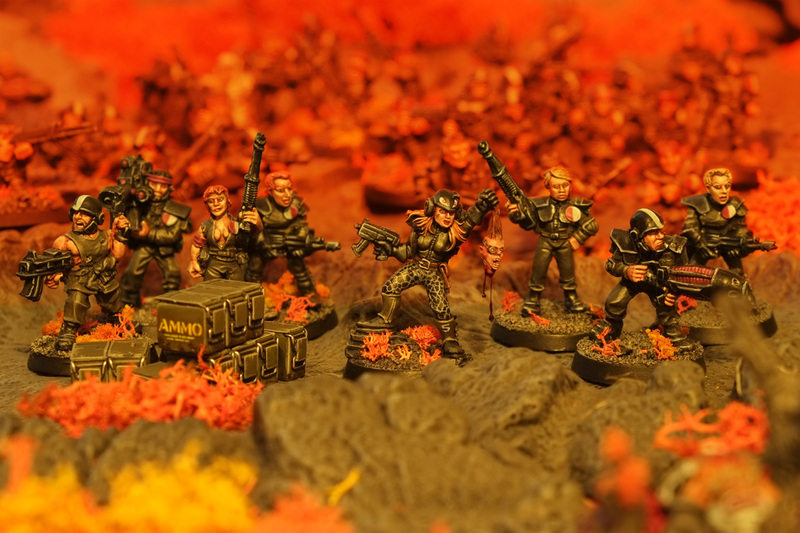 Curtis at Ramshackle Games sculpted this miniature to celebrate his massive participation game at BOYL 2017, set in Helsreach – the iconic Rogue Trader townscape. This miniature is really characterful and fun to paint, and on finishing it I immediately went and jumped some other Ramshackle bits to the front of the painting queue. Curtis is running the game again next month at BOYL 2018, and I recommend stopping by to drink in all those square feet of his miniatures and terrain. The Mayor touring the Cullentown Grox Incubation Facility. His Techpriest tour guide is regarded as the Helsreach's leading "egghead". 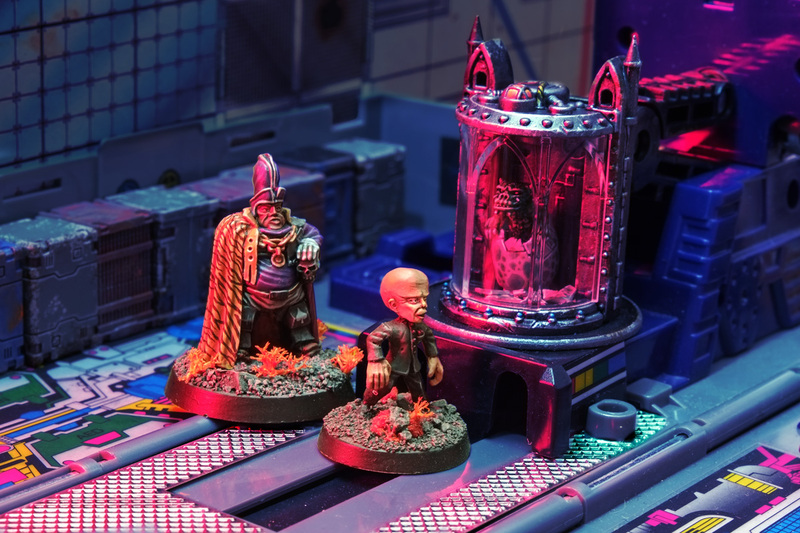 The Grox incubation chamber is a cut-down cryo-stasis piece from Games Workshop's Sector Imperialis Objectives. The transparent "glass" component needed great care to resize – the plastic is so brittle any stress on it will cause massive white cracks to shoot through the whole thing. There were a few near-misses and lots of eggs-pletives. What do you mean the left arm? The whole miniature looks stunted. Lonkka: 90% sure it's the Empire Free Company Dagger Hand.